By now, you must be aware of the various types of RC passages as well the different writing styles. Close to the writing style, comes the tone of passage. As you would know, tone-based questions frequently accompany CAT RC passages. So, what is really meant by ‘tone of the passage’? The tone of the passage represents the author’s sentiment or attitude towards the subject being discussed. In other words, it’s the predominant emotion the author displays towards the subject. You probably react differently to different people in same or different situations. You may speak the same sentence in harsh or polite or sarcastic tone depending upon the context and people. Similarly, RC tones vary in different contexts with same or different subjects. Learning to identify the tone will help you in multiple ways: answering the direct tone based questions as well as figuring out the implicit information and inferences. Tone of the passage is indicative of the message that the author wants to convey to the reader. The same set of words change their meaning if you speak them in a different tone. How would you express your dislike or disapproval for something or someone in a harsh way? Here comes the role of acerbic tone. The author reveals his disagreement with a particular theory or may express his disdain towards a person in an acerbic tone. Once you identify this tone, you will be able to answer the ‘author agree/disagree’ questions that follow the RC passage. Similar to the above type, this kind of tone shows the author’s anger towards the subject in a justified way. How do you justify your anger towards any unfair system? You may do so by some arguments, facts and examples regarding the subject. Similarly, the author intends to justify his anger by stating various reasons related to the issue. Such RC passages revolve around biased systems or policies followed by the authorities. Questions based on such passages are generally direct and easy to answer. As the name states, this kind of tone is used to express remorse or guilt regarding the mishaps or tragedies that may have occurred in the past. RC passages based on this tone generally talk of theories related to world wars, natural disasters or other such catastrophes that have impacted mankind adversely. Such passages may also include a lot of facts and figures. In which tone do you think two warring parties talk to each other? As you would guess, they are aggressively hostile towards each other. This is when author adopts belligerent tone of writing. Think of the feelings that Allies and Axis powers had towards each other. RC passages based on this kind of tone are easily to understand and let you easily predict the answers to inference-based questions. While favouring one thing/person/group over the other, we tend to use a biased tone to display our inclination towards it. Similarly, the author uses a biased tone and presents arguments in favour of a particular thing/theory in the passage. Once you identify the author’s stand, you will be able to figure out the answers to the required questions. This type of tone is used to express grief or show sympathy for a person or a group of people suffering from prejudiced practices or cultural norms. The author intends to familiarize the reader with the trauma undergone by the sufferers. A condescending tone implies an attitude of patronizing superiority of a particular thing/person/group. As you would expect, such RC passages may display snobbish or scornful tones with regard to things considered inferior in the author’s view. This kind of tone exhibits author’s disdain or contempt towards the subject. You will often find such passages treating the subject in a scornful and ridiculous way. How do tend to speak about people you find distrustful? Here comes the role of cynical tone. Passages written in cynical tone reveal author’s view of society being driven purely by self-interest. You must have some firm beliefs and perspective regarding particular aspects of life. In what kind of tone will you speak about them? This is where dogmatic tone comes into play. When the author is assertive regarding his opinions, he uses a dogmatic tone to convey his viewpoint. While narrating an incident/event/story, the author uses an emotional tone of writing in order to portray the feelings regarding the same. Such RC passages may appear complex and need to be reread to arrive at the right answer. As you would know, the issues of ethics in business have assumed greater relevance in the growing corporate culture. Such RC passages commonly feature in CAT exam. The author employs an ethical tone to depict the issues of morality, righteousness, honesty, etc. How do you express your disliking or disagreement without being offensive or blunt? In such a case, euphemistic tone comes to your rescue. RC passages in this kind of tone make use of indirect and implicit statements. As the name suggests, this type of tone is adopted by passages written in a descriptive or abstract style. The passage may appear more elaborative than necessary. Also, sometimes abstract passages utilize a grandiose tone of writing. As you would guess, a humanistic tone of writing is most suitable to issues related to welfare, values and other such human affairs. A good idea for such passages would be to glance at the questions before reading the passage. This way, you will be able to grasp the essence of the given passage/theory. One of the most interesting tones of writing, a humorous tone is witty and amusing at the same time. All you need to do is spot the message that that author wants to convey in a light-hearted manner. How would you talk about analysing your feelings or contemplate your actions? Well, an introspective tone is employed in the passage so as to self-examine and reflect upon one’s actions and feelings. You may have come across some famous speeches by great orators and found their words moving or soul-stirring. Well, that’s an incendiary tone into play. It’s the tone of speech utilized by revolutionaries and politicians as well. In other words, an incendiary tone is meant to incite people in a negative or positive direction. How have you praised something or someone you admired? That’s what laudatory tone sounds like. Often, descriptive passages adopt this kind of tone so as to discuss a particular subject along with certain justifications. Another interesting kind of tone, a motivating tone of writing aims to inspire and propel you by the use of influential quotes and examples. Such passages may present examples of some popular personalities and incidents from their lives. When a passage appears neither interesting nor complex to you, probably it has a pedestrian tone of writing. In other words, this kind of tone is used when the RC passage talks about commonplace things and ideas. As the name says, a populist tone is used to discuss theories and characteristics exhibited by general populace. The author of the passage utilizes a populist tone to explain features and behavior of common people. As you would expect, this kind of tone is fanciful and exaggerated. Such passages may appear interesting to read but contains unrealistic content. This tone is mostly used for abstract RC passages. Try expressing your disliking indirectly and without sounding too serious? Well, most of us have spoken in this way at one time or the other. When the author states a negative opinion about something in a taunting or ironic way, he uses a sarcastic tone in the passage. We do read about various speculations in newspapers- economic, political, etc. Similarly, RC passages explaining any such theories adopt a speculative tone of writing. Putting it other ways, such passages revolve around hypothetical things and expert opinions. 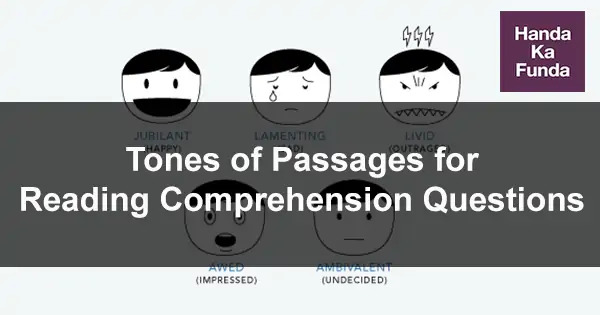 As the name states, the author of the passages tends to use technical jargons while using this tone of writing. This type of tone is generally used to discuss the core ideas of particular fields of study. Such passages are generally accompanied by a lot of facts and figures. Look at the adjectives and adverbs used in the passage and their connotations. The choice of words provides a strong hint of the author’s tone. Another clue is given by the style of writing– whether it is narrative, descriptive, etc. Also, give a broad overview to the structure and organization of ideas in the passage. The bottom-line: read and practice as much as you can. This will help you identify the tone accurately and in a lesser time. Reading Comprehension – Forenoon slot – Set 1: Understanding where you are in the world is a basic survival skill, which is why we, like most species come hard-wired with specialized brain areas to create congnitive maps of our surroundings. Reading Comprehension – Forenoon slot – Set 2: I used a smartphone GPS to find my way through the cobblestoned maze of Geneva’s Old Town, in search of a handmade machine that changed the world more than any other invention. Reading Comprehension – Forenoon slot – Set 3: This year alone, more than 8,600 stores could close, according to industry estimates, many of them the brand -name anchor outlets that real estate developers once stumbled over themselves to court. Reading Comprehension – Forenoon slot – Set 4: Scientists have long recognized the incredible diversity within a species. Reading Comprehension – Forenoon slot – Set 5: Do sports mega events like the summer Olympic Games benefit the host city economically? Reading Comprehension – Afternoon slot – Set 1: Creativity is at once our most precious resource and our most inexhaustible one. Reading Comprehension – Afternoon slot – Set 2: During the frigid season…it’s often necessary to nestle under a blanket to try to stay warm. Reading Comprehension – Afternoon slot – Set 3: The end of the age of the internal combustion engine is in sight. There are small signs everywhere: the shift to hybrid vehicles is already under way among manufacturers. Reading Comprehension – Afternoon slot – Set 4: Typewriters are the epitome of a technology that has been comprehensively rendered obsolete by the digital age. Reading Comprehension – Afternoon slot – Set 5: Despite their fierce reputation. Vikings may not have always been the plunderers and pillagers popular culture imagines them to be.